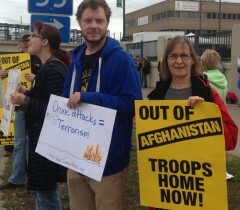 Anti-war protest on 12-year anniversary of war on Afghanistan | Fight Back! (Fight Back!News/Staff) Oct. 5 anti war protest in Minneapolis, MN. (Fight Back!News/Staff) Oct. 5 anti war protest in Minneapolis, MN. Minneapolis, MN - To mark 12 years since the start of the U.S. war in Afghanistan, 50 people joined a Minneapolis anti-war protest on Oct. 5. The protest took place along the sidewalks of the very busy Hiawatha Avenue and Lake Street intersection. A large number of people driving by honked their car horns and waved in support of the anti-war message. One participant said the majority of the cars passing had people honking, waving or showing some sign of support. The Oct. 5 Minneapolis protest was endorsed by AFSCME Local 3800, Anti-War Committee, Coalition for Palestinian Rights, Committee to Stop FBI Repression, Communities United Against Police Brutality, Freedom Road Socialist Organization, Libertarian Party, Mayday Books, Military Families Speak Out (MN chapter), Minnesota Alliance of Peacemakers, Minnesota Cuba Committee, Minnesota Immigrant Rights Action Coalition, Pakistan Trade Union Defense Campaign, Peace and Justice Committee of Sacred Heart Catholic Church (St. Paul), Socialist Action, St. Paul Eastside Neighbors for Peace, Students for a Democratic Society, Twin Cities Peace Campaign, Veterans For Peace (Chapter 27), Welfare Rights Committee, Women Against Military Madness and the Workers International League.